Greetings Again Holo Table Champions! 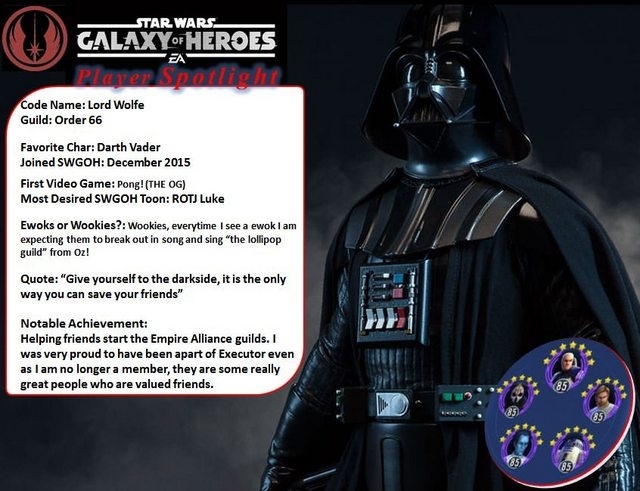 We have #TakebackAugust spotlight this month as we bring you Lord Wolfe of Order 66, nominated by Not only his own guild but several others with the most votes we have gotten to date! What is your favorite aspect/part of SWGOH? Guilds. For me this was the best addition to the game and completely changed the dynamic of it. I enjoy the interaction with my guildmates and the teamwork to work toward common goals, theory crafting, etc. Guilds have changed the game from being something you would log into periodically throughout the day, tap, tap, tap, done to a much more engrossed experience. What is your current Arena Team? Been running Rex (L), GK, R2, DN, and GAT since GAT was released. Did you know who Thrawn was before the game? So a Vader fan? Rogue One final Scene. Yea or Nay? lol yeah I was just thinking about how awesome that would be! No doubt it would be amazing. There's so much about him that's not yet seen in the movies that have already been done. Snoke, Who do YOU think he is? I honestly have no idea. Some of the theories being tossed around are interesting indeed. But maybe Snoke is just Snoke. I look forward to finding out though and hope to be surprised. Finally, we've all heard about territory battles coming and the preview of Hoth. What planet or battle would you want to create as a future board? Hmmm...all? lol But probably something that culminates with an attack on Death Star 1 or 2. Or perhaps an attack on Starkiller Base. You just want to blow a Death Star up! Remember to submit your choices from your guild to me in Direct Messages!, We are looking for the best and valued from your ranks to promote next month! Thanks for all your Help LW. Nice interview! Congrats! Let the endorsement deal commence!